Unfortunately, nature has taken aim at the United States this summer and it isn’t letting up. There are fires in the west, droughts in the middle and hurricanes in the south. Some of these conditions, luckily, are seasonal. For these situations, it is best to be prepared. 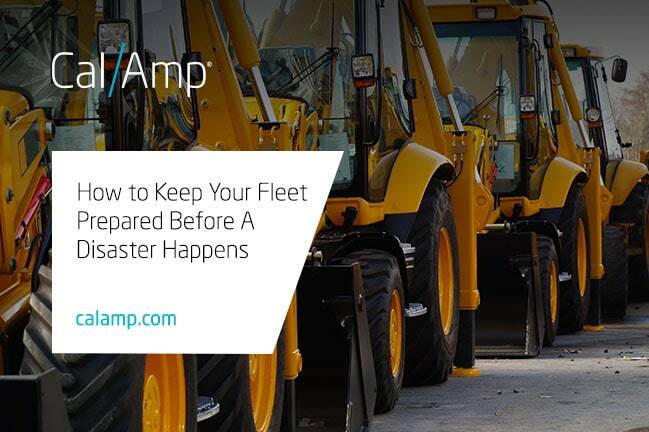 And, in honor of National Preparedness Month, we’re going to take a brief look at using telematics to keep your construction fleet at the ready. While hopefully it will never be used, contractors and rental companies should have a plan in place for when maximum machine uptime is needed. Under normal conditions, fleet managers are working toward optimal equipment utilization; however, extreme conditions require all assets to be working overtime. Even those assets that are only used for specific projects will be called into service. Now, let’s consider equipment that tends to remain idle until needed, especially in emergency situations. These machines require a different way of ensuring they can work immediately. In the past, it could be time consuming to maintain inactive equipment. There was really only one option for testing readiness – physically. An operator would visit each machine to turn it on, check fluid levels and conduct a visual inspection. However, this was only a snapshot of equipment health. With telematics, fleet managers are able to merge the physical inspections with digital records of utilization, breadcrumb location trails and service alerts. This combination provides a 360˚ view of individual machines or the entire fleet in both real-time and historically. Here is one example. Rental companies often maintain a large fleet of generators. Typically, not all units are needed at one time. When a disaster strikes, the entire inventory is pressed into service. The assets become a critical commodity during the rescue and recovery periods. A failure could cause major issues, such as a setback on clearing debris or the spoilage of medication. As part of their operating plan, one firm conducted weekly health tests on their generators. The telematics data provided peace of mind for the company and their clients. As a result, all of the units were ready to deploy when a hurricane hit. And when the equipment is on site, the rental company is able to monitor the status allowing for quick intervention if an issue arises as well as helping to protect the assets from theft (e.g., virtual boundary exit alerts). Telematics provides the necessary visibility into the health of your construction equipment whether it is sitting on your lot or working on site. The data allows for proactive and even predictive maintenance, the machine tells you when it needs a tune up or a repair, which helps to reduce operational costs and the total cost of ownership. This intelligence at the edge helps optimize mixed fleets and your operations, especially when the call comes to muster the fleet. If you would like more information on AssetOutlook™, please visit our construction page here.